What could possibly further enhance the other-worldly taste of Acid cigars? How about a naturally sweet Candela wrapper leaf to add a smooth new dimension of mouthwatering flavor? 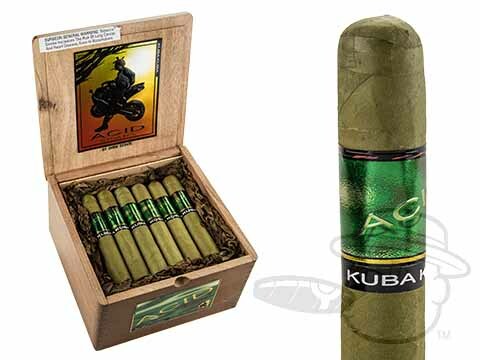 The Acid Kuba Kuba Candela wraps a gorgeous green Candela leaf over the one-of-a-kind aromatic infused tobaccos you know and love, creating a bold new profile for the Acid portfolio. Grab yourself a box of the radically delicious and satisfyingly sweet Acid Kuba Kuba Candela today! Awesome new look for Acid. And flavor is a home run as always. Same flavour as the Kuba Kuba Blue, but the candela wrapper starts softly, but gets louder. This is a great cigar. The flavor is fantastically smooth & smokes well the whole way through. Absolutely amazing.. love the candela wrapper!! Smoked a Kuba Kuba and enjoyed it so tried this. I did not like this one, smoked 1/4 and tossed it out the window. Acid Kuba Kuba Candela is rated 4.1 out of 5 based on 12 customer ratings.